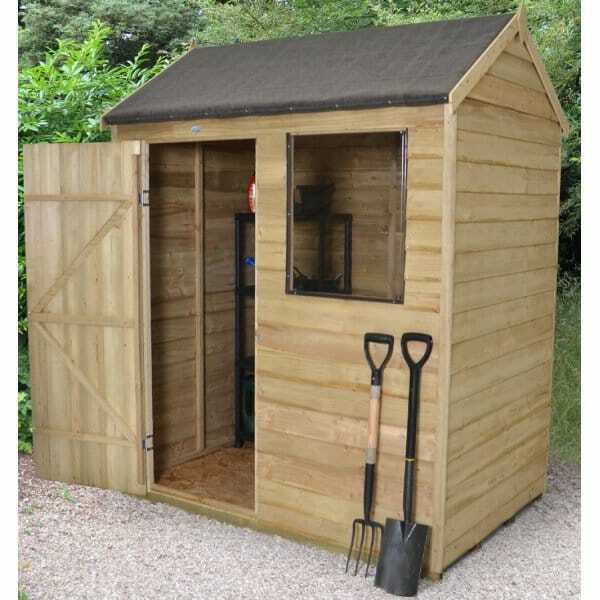 Forest Garden 6 x 4 Overlap Pressure Treated Reverse Apex Shed: This garden shed from the Forest Garden range of wooden storage solutions is pressure treated to give it a long life without the need for applying yearly treatment yourself. This shed has a compact size of 6 x 4 which will allow the shed to fit into a smaller garden to provide much needed storage space for gardening tools and equipment. The timber is FSC certified and from a sustainable source and is finished in a rough sawn overlap timber that is square cut to allow the rain to run off the sides of the walls. The roof style on this shed is reverse apex which means that the ridge runs from side to side rather than front to back which means that the shed is wider than it is long with the door and window in the front longer side of the building. The door has a Z framing to provide added strength to the building and the window has polycarbonate glazing that will not break or discolour over time. This garden shed is delivered in easy to manage sections and is an easy self-assembly proposition.